GearBest (western-facing company that ships from Asia) is having a weekend 48 hour sale which includes the 256GB Kodak microSDXC card (V30, A1, U3) offered for $40 with near-free shipping (depending on options/location). The certified refurbished Kodak PIXPRO SP360 Action Cam is currently on sale for $75 with free shipping, sold by a 3rd-party seller with the orders fulfilled by Amazon. This is not a lightning deal, so expiration time unknown. If you are feeling Kodak nostalgic and need an Android smartphone as well, B&H Photo is offering the new condition Kodak EKTRA 32GB Smartphone (Unlocked, Black) for $120 with free shipping and TWO free accessories: a Kodak leather case for the camera phone and a Kodak remote shutter release. The phone has a 5″ FHD (1920 x 1080) display with 3GB RAM, the Helio X10 ten core processor, 32GB storage, USB-C, NFC (so you can pay with your cameraphone too), 21mp f2 OIS lens, and a DSLR Dial simulated on the touchscreen using vibrations. It’s back in-stock again and down to $100 with free expedited shipping, it is the new condition, unlocked with warranty Kodak EKTRA smartphone (32GB, black, GSM) at B&H Photo. Feeling a bit of a Kodak nostalgia? $100 is what it takes to feed the nostalgia in a modern kind of way as B&H Photo is offering the new condition Kodak EKTRA 32GB Smartphone (Unlocked, Black) with free shipping. This is a GSM phone, no contract, North American variant. Limit up ten per customer. This is a limited time offer, expiration date unknown. This is an Android phone wit USB-C.
On the nostalgia front, the new condition factory-unlocked GSM Kodak EKTRA Android Smartphone is on sale for $299 with free shipping by Amazon itself and B&H Photo. This is a Mediatek device with 3GB RAM, 32GB on-board, 5″ 1080p screen, NFC, USB-C, etc. One of the day-long Gold Box deals of the day is the Kodak Dock & Wi-Fi 4×6” Photo Printer with Advanced Patent Dye Sublimation Printing Technology & Photo Preservation Overcoat Layer – Compatible with Android & iOS on sale for $100 with free shipping by DB ROTH with the order fulfilled by Amazon (Prime eligible). Offer ends by 3am ET on Saturday or earlier if sold out. There are nearly 60 items listed in the Camera & Photo lightning deals (old format) or Full page format of the Amazon Gold Box. Due to time constraints I cannot create a detailed listing of them all. The usual assortment of rigs and stabilizers, action cams, studio/lighting kits, bags, tri/monopods, and more are running throughout the day. Meanwhile, Prime Day is just around the corner. It officially starts Monday at 9pm ET, but like Black Friday, the action has already began in the background. To practice for this, I have already began the Prime Day Situation Room that will be updated throughout Prime Day. Meanwhile-meanwhile, good until 3am ET on Friday, as one the daily deals is the Etekcity Wireless Remote Control Electrical Outlet Switch for $24. You get two remote controls and five AC power receivers per bundle. You can buy as many bundles as you like. The remote control is via good old RF, not bluetooth. It averages 4.7 with over 6100 customer reviews. Meanwhile our Prime Day Situation Room is updated throughout the day as we practice before the actual Prime Day. There is a “Latest Update” time in that post to let you know when it was last updated. If interested, bookmark it, or look for the link at the top of the Sidebar. The headliner of today’s Lightning Deals is the new condition Kodak PIXPRO SP360 Action Cam with Explorer Accessory Pack going for $130 with free shipping. The price before the sale was $165 last night. Offer ends 12:25am ET on Friday (or earlier if sold out). The Kodak SL10 Pixpro Smart Lens Camera for Smartphones is currently on sale for $80 with free shipping at Adorama as one of their Warehouse Clearance sale items. The Kodak PIXPRO SP360 Full HD 1080p Action Camera with a variety of accessories that are part of the kits are on sale for $200 in Explorer or Aqua packs, and $250 in the Extreme packs, at Adorama. The $200 kits also come with a 32GB Delkin microSD included by Adorama. 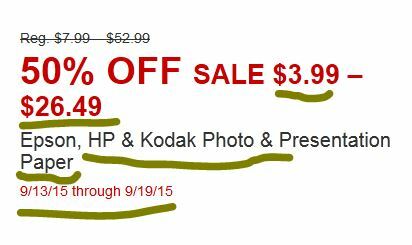 For the week of September 13-19 in 2015, at Office Depot and Office Max, there is going to be a 50% off sale on Epson, HP and Kodak papers. No coupon, no rebate, their system will change to reflect the sale price. Selection likely varies by store and region. Check their website and/or Weekly Ad over there for more details. The not-Rochester-Kodak S1 two lens kit (12-45, 42.5-160mm) is currently offered for $380 with free shipping in two color scheme choices at Costco. Non-members can buy it with a 5% surcharge bringing it up to $400. The post-Rochester Kodak PixPro AZ251 Astral-Projection superzoom (25x optical) is currently on sale in three different colors for $110 at the Staples website. To see the sale price, you have to select one of the three colors. The price before you select a color is $135.19. Staples really need a new website infrastructure system but I’m going off on a tangent now. This appears to be price-matched by Amazon.com in one of the three colors. The reviews at Amazon are all over the place, so do research the camera if you are not already familiar with it.